Fox Builder Punch | Stampers With Altitude!!! … I thought I would wow you with a card. This is probably the second card I made all year. YIKES! Don’t worry. This won’t happen again. I intend to keep stamping! At any rate, I got a phone call from a customer. “I need a Christmas card with a fox on it.” This is the result! The customer calls me every year for a Christmas card for her dad. She makes the cards for him and gets some product to boot! This adorable fox came out of the Holiday Catalog. It is the hostess set called, “Cozy Critters.” I’ll have another project for you using the same set later. I am hoping to take better pictures of it with my new light box that can’t get here fast enough! I will just have to apologize for the poor lighting on the photos for just a little while longer. Sorry! hehe. I used markers on the Fox because I thought his tail band and scarf should stand out. I also thought that his eyes and nose should be different too. I think it turned out really well! Don’t you? Below are a list of the supplies that I used to make the card. It’s a pretty intense list but when you have been in this business as long as I have, you accumulate… horde a lot of stuff! 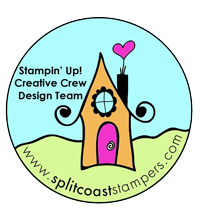 Big Shot by Stampin’ Up!